Sri Lanka has failed to implement a single major electricity generating power plant since 2014. 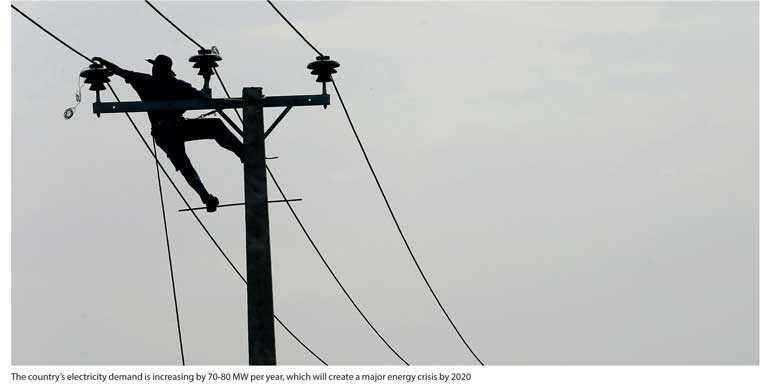 Meanwhile, the country’s electricity demand increases by 70-80 MW per year, creating a major energy crisis by 2020. As part of the solution to the impending power crisis, in November 2016 international tenders were called for the supply of 300MW capacity Liquefied Natural Gas (LNG) power generation plant, to be located at Kerawalapitiya, on Build, Own, Operate and Transfer (BOOT) project basis for a 20-year period. In large tenders, tenderers are expected to submit a Bid Bond, to qualify to bid for the project and a Performance Guarantee – An insurance guarantee ensuring that the Contractor would perform all their obligations under the contract. The tender itself is in two parts: Technical Proposal and the Financial Proposal. The tenders would be evaluated by the Technical Evaluation Committee (TEC) and the Standing Cabinet Approved Procurement Committee (SCAPC). The Technical Proposal evaluation ensures the Bonds are proper and ensure that the tenderer has sufficient experience, technical and financial capability to carry out the project. Technical Proposals are opened first and those acceptable to TEC, Financial Proposals would be opened. When the tenderer is selected, a contract agreement would be signed, generally based on FIDIC Conditions of Contract. (FIDIC is a French acronym for Fédération Internationale Des Ingénieurs-Conseils, which means the International Federation of Consulting Engineers). If the tenderers are not satisfied with the decisions of the TEC or the SCAPC, they could appeal to PAB who is expected to review the decisions. The system supposedly ensure transparency in procurement and the entire procedures are expected to be confidential. When the tenders closed in April 2017, eight companies had submitted bids. Among them were 1. Consortium of Samsung C&T, 2. Korea Midland Power Co (KOMIPO), 3. GSL Energy, 4. Lakdhanavi Ltd., 5. China’s Golden Concord Holdings (GCL) with local partners WindForce and RenewGen. In the current scenario, the TEC consisted of 13 members, some from CEB and others nominated by the Ministry of Power and Energy. Here most technical paperwork of the tender evaluation was carried out by the CEB engineers in the TEC, along with others. The tenderers were expected to submit their bids with a hard copy (in book form) and a soft-copy (CD). Although the tender contents were supposed to be confidential, technology allows contents of the soft-copy be sent to anywhere in the world. When decisions were made in selecting one party, others appealed to the PAB. Ministry of Power and Energy too changed the composition of TEC and SCAPE several times, naturally giving different decisions. TEC initially refused to open the Lakdhanavi tender due to conflict of interest. Lakdhanavi is a subsidiary of Lanka Transformers Ltd, affiliated to Ceylon Electricity Board and would result a conflict of interest situation. However, it was pointed out that earlier too, different Procurement Appeal Boards (PABs) have rejected two tender awards to Lanka Transformers Ltd. (LTL) pointing at conflict of interest as CEB is the major shareholder of LTL. However, the decisions were reversed by the Supreme Court and the Cabinet. In addition, the Supreme Court reversed the decision of the PAB to re-award the New Galle Transmission Development Project Lot B to LTL. Also the Cabinet reversed the decision of the PAB, and awarded the 24MW diesel power plant tender in Jaffna to LTL. When above was pointed out TEC agreed to open the Lakdhanavi’s tender. The first round in opening financial proposals, saw the Samsung Consortium, being knocked off. Korean consortium complained their commercial proposal was disregarded “because of a really trivial document error”. At the opening of the financial bids, TEC officials were unable to open the Consortium’s pen-drive with their laptop. Samsung’s formal representative complained the laptop to be inferior and the tenderer’s offer to open the pen-drive with their laptop was disallowed. Samsung complained to PAB that it was the only properly qualified bidder, as the tender demanded a plant capable of using liquid fuel, later be converted to liquefied natural gas, as the country does not have a gas receiving station. Other seven bidders had not conformed to the minimum functional specifications. But later, it was discovered that Samsung’s bid was costly, the tariff was higher. A second SCAPC was appointed with instructions to open the financial bids of other five bidders shortlisted by the TEC. Recommended bidders included Consortium of Samsung C&T, KOMIPO and GS Energy. There was so much controversy in the tender analysis, various members supporting different tenderers, influence by the politicians. Members of TEC, SCAPC as well as PAB changed several times. During the evaluation period Tender Committees changed so much, on four occasions TEC recommended the tender be awarded to Lakdhanavi Ltd. The 13-member TEC took almost one year to recommend awarding of the project. But finally the contest narrowed down to two parties – Lakdhanavi Ltd., a subsidiary of prestigious LTL Holdings and Golden Concord Holdings (GCL) with its local partners WindForce and RenewGen headed by Chairman Ali Asghar Akbarally and Vice President Yu Xiaodong. When tender prices were compared Lakdhanavi Ltd. had offered the lowest tariff rate of Rs. 14.98 per unit, with their plant costing $ 175 million, while China’s Golden Concord Holdings (GCL) offered a tariff of Rs. 15.97 per unit, indicating the project cost at $ 299 million. Lakdhanavi’s project cost was much lower than the Government’s estimate, suggesting a lower quality, cheap project, questionable in delivering an acceptable product. However, one rupee difference between the two tenderers generating 300MW power would result a potential loss of Rs. 2 billion per year or Rs. 42.5 billion over the 20-year contract period. A substantial sum to the heavily debt-ridden CEB. The main concerns over Lakdhanavi bid were conflict of interest and the financial viability. The Chinese supplier had argued at the PAB hearing that Lakdhanavi Ltd. would not be able to complete the project at $ 175 million as the company was expecting an exemption of VAT and NBT for steam turbines, gas turbines and other auxiliary items, which account for 22% of the project cost. Lakdhanavi’s $ 175 million plant cost was based on exemption of VAT and NBT for power generation equipment, accounting for 22% of the project cost. If the exemptions are disallowed, the Company would infuse Rs. 4 billion, raising the project cost. No one questioned the $299 quoted by the Chinese be reasonable. Lakdhanavi officials affirmed that they were considering financing from Germany based KfW Development Bank. Also noted it was customary to request a higher loan amount up for negotiations. Lakdhanavi Ltd. is the largest independent power producer in the country, the power plant construction and operation subsidiary of LTL Holdings Ltd., a subsidiary of CEB. Since its inception in 1997, Lakdhanavi has completed six power projects locally, including the 300MW Combined Cycle Power Plant in Kerawalapitiya. Lakdhanavi through LTL had been in operation in Bangladesh running four power plants. In 2017 won the international tender for the construction of a 114 MW power plant in Bangladesh, the 5th power plant by LTL. Above shows Lakdhanavi is technically competent to undertake the project. At the beginning, some TEC members refused to consider the tender of Lakdhanavi Ltd., quoting conflict of interest as CEB is a partner of Lakdhanavi. The tender award dragged further owing to disagreements in opening the financial bid of Samsung JV Korea Group without considering bids of other seven firms. Apparently, TEC members had different views possibly supporting different tenderers. Finally in April 2018, both TEC and SCAPC decided to award the contract to the lowest tenderer Lakdhanavi Ltd. However, Samsung JV Korea Group and GCL Windforce and RenewGen appealed to the PAB to amend the decision. Following the appeal, the Procurement Appeal Board (PAB) rejected the 300MW Kerawalapitiya Liquefied Natural Gas (LNG) power plant tender contract from the lowest bidder, Lakdanavi Ltd, and instead recommended the contract to be awarded to the second lowest bidder, GCL Windforce and RenewGen. The decision possibly due to political influence. Patali Champika Ranawaka, former Minister for Power and Energy, during January to August 2015 presented the ‘Sri Lanka Energy Sector Development Plan for a Knowledge-based Economy, 2015-2025’. The plan proposes to increase generation capacity to 6,400MW by 2020, generate 1000MW of electricity using gas discovered in Mannar and convert existing thermal plants to natural gas; develop renewable power as bio-mass, mini-hydro, solar and wind-power to generate 1114MW. Also to achieve self-sufficiency in energy and produce entire petroleum requirement by 2025, based on gas from Mannar becoming available by 2020. Ranjith Siyambalapitiya took over the Ministry in August 2015 and had been silent on the former Minister’s energy policy within the Yahapalanaya Government, although the former Minister continues to be a Cabinet Member. Meanwhile, Public Utilities Commission of Sri Lanka (PUCSL) involved in the power generation plan war with CEB on usage of coal, prior to approval of the “Long-Term Generation Expansion Plan for 2018-2037”, PUCSL had requested “energy policy guidelines” from the Ministry of Power and Energy, but the Ministry had been silent. Some months ago, the Minister Siyambalapitiya submitted a Cabinet Paper for the CEB to bear taxes payable by CEB officials, but the Cabinet turned the request down. But CEB had continued to bear the burden and was queried by the Auditor General. The payment was highlighted in the Daily FT Editorial which disclosed a payment of a staggering sum of Rs. 1,400 million. It is well known that CEB is not alone in the game. Water Board, Ports Authority, Petroleum Corporation and SriLankan got themselves exempted from normal Government status and staff have received exceptionally high salaries and various allowances. Now, CEB got caught to Auditor General, how about others? In June, Power Minister Ranjith Siyambalapitiya submitted a Cabinet proposal seeking approval to award the Kerawalapitiya tender to China’s Golden Concord Holdings. He briefed the Cabinet to disregard Lakdhanavi offer as Lakdhanavi’s cost being too low and implementation is questionable. But Minister Patali Champika Ranawaka responded to the Minister that if the tender were offered to the higher bidder would cause a loss of $42 million to the State over 20 years. During the discussion Ministers Mahinda Samarasinghe and Nimal Siripala de Silva supported the Power Minister. Minister Silva questioned the ability to execute the project at low cost. Finance Minister Mangala Samaraweera made his observations in a memo to the Cabinet in response to the Kerawalapitiya Cabinet memo in favour of the Chinese company, highlighting conflict of interest. The Finance Minister may not have been aware of Court decisions over the matter. Also, the award of tender to Chinese at the higher rate would cost the country Rs. 22.5 billion for the next 20 years. The Finance Minister may have overlooked the CEB’s losses and outstanding long-term and short-term debts. Finally, the Cabinet appointed a three-member committee to investigate. But later had to postpone the decision pending the Supreme Court ruling over the Fundamental Rights petition filed by the National Movement for Consumer Rights Protection in Sri Lanka, against the award of the tender to a higher bidder. German Ambassador to Sri Lanka Jorn Rohde questioned the “transparency” and “openness” of the tender procedure regarding attempt to award of Kerawalapitiya LNG power plant tender to a higher bidder. He questioned the PAB’s reversal of the original decision to award the tender to the lowest bidder, LTL Holdings that uses German technology. The Ambassador highlighted the need to have an open and transparent tender process. When the lowest bidder was unanimously selected. Suddenly, the PAB reversed the decision. The questions raised, I am told, have all been answered in the selection process at SCAP and at the TEC. The award of the Kerawalapitiya tender dragged for over a year; to address the power shortage, CEB will have to supplement with power bought from private power producers costing between Rs. 28 to 32 per unit (over double the tender rate). The Finance Minister in his memo to the Cabinet wished the tender be awarded to the Chinese company, highlighting conflict of interest. TEC is scheduled to examine the tenderers experience and financial capability of undertaking a project. Only tenderers conforming to requirement would be entertained. As for Lakdhanavi’s conflict of interest, issue had been resolved by the Supreme Court. The Finance Minister may not have been aware of Court decisions. The Minister Power and Energy in charge of the project, submitted a Cabinet proposal seeking approval to award the tender to CGL China. He briefed the Cabinet to disregard Lakdhanavi offer as Lakdhanavi’s cost being too low and implementation is questionable. The Minister should have been aware of Lakdhanavi’s background, the biggest independent power supplier in the country, having implemented 7 power generation projects in Sri Lanka and four projects in Bangladesh. The project cost is relevant only to the tenderer, as the country would pay only for the power supplied at the tendered price Lakdhanavi’s Rs. 14.98 per vs. GCL’s Rs.15.97 per unit, resulting a saving of Rs.2 billion a year. Biggest worry of the low priced tender was the quality of product. The German Ambassador’s statement cleared the concerns, German technology used is far superior to Chinese, with funding coming from a German bank. Germans would be sure to ensure a quality product, be delivered on time, addressing all doubts on the tenderer. The Power and Energy Minister under whom the project falls should have been happy to award the tender at a lower price to a local company. Did the Minister understand his predecessor’s clean energy policy was a new policy ever discussed? When CEB produced the Long-Term Power Generation policy with almost exclusive coal and when PUSCL asked for energy policy he never had any. Did the Minister ever looked up CEB’s losses, long- and short-term liabilities and staff salaries and various allowances, prior to submitting the Cabinet paper for CEB to absorb taxes payable by the employees, an illegal gesture? The award of the Kerawalapitiya tender dragged for over a year, as most parties, politicians and administrators did not understand the tender procedure. When proper tender procedures are administered, all concerns would be addressed by the system. The international tendering system and the Conditions of Contract had been developed over centuries for the very purpose. The tender procedure adopted displayed the world, the corruptive nature of our politicians and officials in award of international tenders. It is unfortunate for the country to have ignorant politicians and administrators making decisions on technical projects costing billions of rupees, considering only their personal gains.